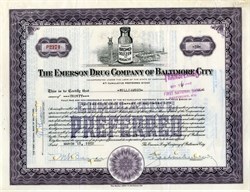 Beautifully engraved SCARCE certificate from the Emerson Drug Company of Baltimore issued in the early 1950's. This historic document was printed by the Barton Gillet Company and has an ornate border around it with a vignette of an Emerson's Bromo Seltzer Tower Building with the Maryland Glass Corporation and other landmarks in the background. This is the view you see in the Baltimore Orioles Baseball Stadium at Camden Yards. This item is hand signed by the Company�s President and Secretary and is over 60 years old. Bromo-Seltzer (acetaminophen, sodium bicarbonate, and citric acid), was a brand of antacid to relieve pain occurring together with heartburn, upset stomach, or acid indigestion. First produced by inventor Isaac E. Emerson's drug company of Baltimore, Maryland, in 1888, Bromo-Seltzer was sold in the United States in the form of effervescent granules which must be mixed with water before ingestion. The product took its name from a component of the original formula, sodium bromide. Each dose contained 3.2 mEq/teaspoon of this active ingredient. Bromides are a class of tranquilizers that were withdrawn from the U.S. market in 1975 due to their toxicity. 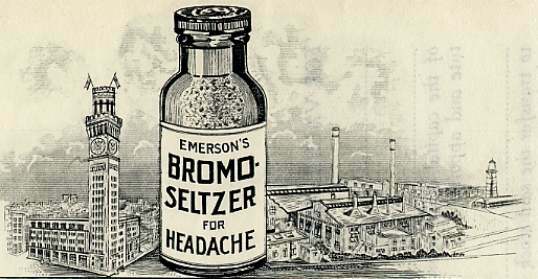 Their sedative effect probably accounted for Bromo-Seltzer's popularity as a remedy for hangovers. Early formulas also used, as the analgesic ingredient, acetanilide, now known as a poisonous substance. Bromo-Seltzer's main offices and main factory were located in downtown Baltimore, Maryland, at the corner of West Lombard and South Eutaw Streets. The factory's most notable feature was the clock tower, built in 1911, which featured "BROMOSELTZER" in place of the numbers on all four clock faces. The tower was patterned on the Palazzo Vecchio in Florence, Italy; it is listed on the National Register of Historic Places. The tower originally had a 51 ft (16 m) Bromo-Seltzer bottle, glowing blue and rotating. The sign weighed 20 tons (18.1 tonnes), included 314 incandescent light bulbs, and was topped with a crown. The sign was removed in 1936 because of structural concerns. In 1888, behind the prescription counter of a modest drugstore on East Pratt Street near Charles in Baltimore, Isaac E. Emerson first conceived the idea of the headache remedy. His background in chemistry and pharmacy led to the development of a granular effervescent salt he named "Bromo-Seltzer." Dispensing it to friends and customers at his drugstore,it soon became so successful that he abandoned his retail business to devote his time to the manufacture of his product. Eventually, he organized the Emerson Drug Company, incorporating it in Maryland in 1891. Bromo-Seltzer was first sold in blue glass bottles that were manufactured by the Cumberland Glass Company, of Bridgeton, New Jersey, although one source lists Hazel-Atlas as the bottle maker. As the demand for Bromo-Seltzer grew, Cumberland was unable to meet the demand for the bottles. Captain Emerson then asked Philip I. Heuisler, his vice-president in charge of manufacturing, to organize a glass factory to make the bottles. Acin light or dark blue glass. It is believed some were given to drugstores as premiums for ordering Bromo-Seltzer. Others were gifts to glass factory visitors who made a two-and-a-half hour tour of the plant for thirty cents. By 1928, the Bromo-Seltzer business, although larger than ever before, represented only about twenty-five percent of the total manufacturing capacity of Maryland Glass. In the decades following, Maryland Glass continued to expand and, by 1964, the firm employed some seven hundred people who worked around the clock, turning out approximately one million glass bottles and jars each day. The company became the leading producer of blue glassware in the world. FIZZIES� was also invented by Emerson Drug Company. The idea derived from scientists working with chemical formulas similar to "Bromo Seltzer" and wondering if a fun, fruit flavored drink could be developed the same way. "Wouldn't it be grand if we could drop a tablet in a glass of water and have an instant soda pop?" After long hard work, they finally figured out how to combine the right combinations of fruit flavoring, sweetener, citric acid and sodium bicarbonate (a substance that is much like baking soda) into a magical tablet that when dropped into water, turned water into an instant sparkling, effervescent fruit drink! In 1956, Maryland Glass, together with its parent company, Emerson Drug, merged with Warner-Lambert Pharmaceutical Company, of Morris Plains, New Jersey. The Warner-Lambert Pharmaceutical Company is now part of Pfizer. Captain Isaac Edward Emerson, the son of farmer Robert J. Emerson, was born Chatham County, North Carolina in 1859. He graduated from the University of North Carolina in 1879, later spending time as an instructor in chemistry there. During the time he was establishing his business, Captain Emerson also led his own naval force during the Spanish-American War. In 1894, he formed the Maryland Naval Reserves and, by 1898, provided the entire crew for the United States Ship Dixie. Comissioned a Lieutenant, he received his rank as Captain after the war. Emerson was considered a pioneer among America's businessmen because he realized the importance of advertising. At the time of his death in 1937, he had accumulated an estate of $20 million, owning the controlling stock in four corporations: Emerson's Bromo-Seltzer, Inc.; the Emerson Drug Corporation; the Maryland Glass Corporation and the Emerson Hotel. His home at Brooklandwood, the Green Spring Valley estate in Maryland, was considered a showplace. Among his other properties, he owned a summer villa at Narragansett Pier and thousands of acres of hunting preserves in South Carolina. He and his daughter Margaret (whose second husband, Alfred Gwynne Vanderbilt lost his life when the Lusitania was torpedoed) were interested in breeding horses. Captain Emerson also owned two yachts, which he used for long cruises and around-the-world trips. He and his second wife, Mrs. Anne Preston McCormack Emerson, were widely known in American and European society. Situated at the comer of South Eutaw and West Lombard Streets, the Bromo-Seltzer Tower Building has been a landmark in Baltimore since the early part of this century. A former Maryland resident recalls hearing that Captain Emerson modelled the tower after one he had seen in Florence, Italy. Certainly, a comparison with the Palazzo Vecchio, by architect Arnolfo di Cambio, confirms the resemblance. Although the tower is fourteen stories high, the top story is numbered fifteen because there is no floor numbered thirteen. According to an earlier newspaper account, the flashing light on the huge revolving Bromo-Seltzer bottle atop the tower served as a guide to aviators flying the night mail. It could be seen from trains arriving in the city. In 1935, the bottle was taken down, after twenty-five years of dominating that part of the Baltimore scene. The base upon which it stood was disintegrating. The outer covering was burned and its framework sold as twenty tons of scrap metal. The Arts Tower Committee reopened the Tower Building in 1973 as an arts and crafts center. An adjoining part of the building is presently used as a firehouse. A decision was made only recently to preserve the landmark building, now dwarfed by larger office buildings in the area.